Rainbow Dairy Farm is a 500 Piece Jigsaw Puzzle designed by Linda Picken. 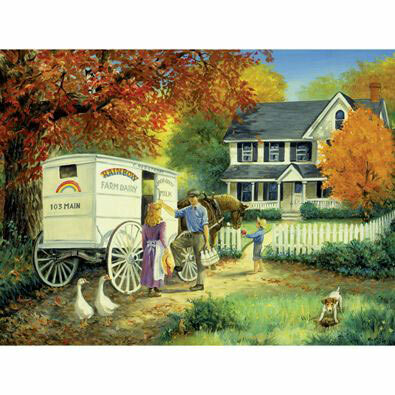 On a crisp autumn morning, the wagon from Rainbow Dairy Farm comes by to drop of the milk to a scenic house. As a father talks to milk maid, a young boy feeds the wagon horse before returning to his playful hound.